Kupono Mele-Ana-Kekua, 35, of Kaaaawa, Hawaii, blows a conch shell near the summit of Mauna Kea on Hawaii's Big Island, Monday, Aug. 31, 2015, protesting construction of the Thirty Meter Telescope. Any day now — or perhaps weeks from now -- a caravan of trucks hauling heavy equipment will begin the eight-mile climb up Mauna Kea, a sleeping volcano on the “Big Island” of Hawaii, the first step toward building the Thirty Meter Telescope (TMT), the largest in the world, and the first of its kind. Unless, that is, Kanaka Maoli (Native Hawaiian) activists and their allies can find a way to stop them, as they did in 2015. Land use is a particularly sensitive subject for the Kanaka Maoli. Mauna Kea is part of the Crown Lands, 7,300 square kilometers (1.8 million acres) of land that belonged to the Hawaiian monarchy before it was overthrown — with U.S. help — in 1893. 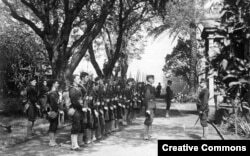 The USS Boston's landing force of U.S. Marines on duty at the Arlington Hotel, Honolulu, at the time of the overthrow of the Hawaiian monarchy, January 1893. When Hawaii became a U.S. state in 1959, all Crown Land was turned over to the Hawaiian government, to be held in trust managed for the benefit of the people. Five years later, the state designated Mauna Kea a conservation district. In 1968, the state leased more than 111,000 acres of Mauna Kea to the University of Hawaii for $1 a year, a deal that benefits only the university, but not, activists say, the Kanaka Maoli themselves. Since then, 13 telescopes have been built on Mauna Kea’s summit. In 2003, the University of California and the California Institute of Technology began developing the TMT. 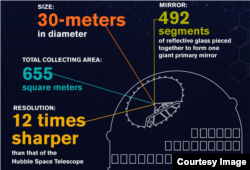 Consisting of 492 mirrors aligned into one contiguous mirror, it will give astronomers an unprecedented glimpse back in time and space — as far back as the first generation of stars to emerge out of the Big Bang more than 13 billion years ago. The TMT will shed light on some of astronomy’s biggest mysteries: black holes, dark matter, dark energy, as well as the possibility of life on other planets. “For an astronomer, this is like being a kid in a candy shop,” said Doug Simons, director of the Canada-France-Hawaii Telescope, explaining why scientists selected Mauna Kea as the site for the TMT. Mauna Kea also has a unique topography. “It has a gentle slope as it rises 14,000 feet (4,200 meters) up from the Pacific Ocean. There are no jagged edges on Mauna Kea, which means trade winds blow up and over the top of the volcano with very little turbulence,” Simons said. That means astronomers can get a better look into space from Mauna Kea than practically anywhere else. 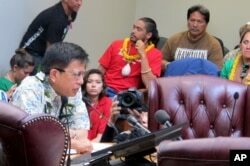 But Lanakilaoka Mangauil, the Kanaka Maoli director of the Hawaiian Cultural Center of Hamakua, views the TMT as a violation — culturally, environmentally and legally. The mountain is dotted with shrines and burial sites, which Mangauil said are at risk of desecration. TMT developers, however, say there is no cause for concern. "Great care was taken to identify the best location for TMT out of respect for Mauna Kea’s rich ancestral history and the spiritual beliefs of Native Hawaiian culture,” said TMT spokesman Scott Ishikawa. “The selected site is below the summit, has no archaeological shrines or features, and has no burials." Mangauil bristled at the suggestion this is a clash of culture versus science. For Native Hawaiians, he said, culture and science are one and the same. A Wekiu bug (Nysius wekiuicola) on volcanic cinder, Mauna Kea, at 13,400 feet (4,085 m) elevation. 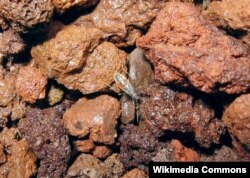 He listed plant and animal species, including the Weiku bug, that don’t exist anywhere outside of Mauna Kea’s summit. “How do you protect a natural fragile natural ecosystem? You just don’t access it,” he said. TMT’s environmental impact statement says no wells extracting groundwater exist near the summit of Mauna Kea, and that it will collect all waste and transport it down the mountain for treatment and/or disposal elsewhere. TMT’s Ishikawa suggested it could be months before crews start clearing the site, but Mangauil said he has heard rumors they could begin within a couple of weeks.